4 Graduate Prosthodontics, Baylor College of Dentistry, Texas A&M University, Dallas, Texas - USA. © Al Jabbari et al. ; Licensee Bentham Open. The debonding load of heat-activated polymethylmethacrylate (PMMA) denture base resin material to a nickel-chromium-beryllium (Ni-Cr-Be) alloy conditioned by three different surface treatments and utilizing two different commercial bonding systems was investigated. Denture resin (Lucitone-199) was bonded to Ni-Cr-Be alloy specimens treated with Metal Primer II, the Rocatec system with opaquer and the Rocatec system without opaquer. Denture base resin specimens bonded to non-treated sandblasted Ni-Cr-Be alloy were used as controls. Twenty samples for each treatment condition (80 specimens) were tested. The 80 specimens were divided into two categories, thermocycled and non-thermocycled, containing four groups of ten specimens each. The non-thermocycled specimens were tested after 48 hours’ storage in room temperature water. The thermocycled specimens were tested after 2,000 cycles in 4°C and 55°C water baths. The debonding load was calculated in Newtons (N), and collected data were subjected by non parametric test Kruskal-Wallis One Way Analysis of Variance on Ranks and Dunn’s post hoc test at the α = 0.05. The Metal Primer II and Rocatec system without opaquer groups produced significantly higher bond strengths (119.9 and 67.6 N), respectively, than did the sandblasted and Rocatec system with opaquer groups, where the bond strengths were 2.6 N and 0 N, respectively. The Metal Primer II was significantly different from all other groups (P<0.05). The bond strengths of all groups were significantly decreased (P<0.05) after thermocycling. Although thermocycling had a detrimental effect on the debonding load of all surface treatments tested, the Metal Primer II system provided higher values among all bonding systems tested, before and after thermocycling. Keywords: Debonding load, Metal conditioners, Denture base material, Nickel-chromium-beryllium alloy, Rocatec system. Strong adhesion between the denture base material and the metal framework of a removable dental prosthesis (RDP) is an important consideration during fabrication, The absence of chemical bonding can introduce microgaps that may lead to the deterioration and discoloration of an RPD . Metals used in the fabrication of a framework require sufficient strength to resist biting forces and corrosion and must be biocompatible with oral tissue. The most widely used base alloys used in the fabrication of removable dental prostheses, are cobalt-chromium (Co-Cr) and nickel-chromium (Ni-Cr) based. Nickel-chromium-beryllium (Ni-Cr-Be) alloys are softer and have lower solidus at the expense of corrosion resistance . Air abrasion has been shown to increase the bond strength between different types of metallic substrates and acrylic resin denture base materials. These effects have been reported for Ni-Cr-Be alloys [3, 4], Co-Cr alloys , silver-palladium-copper-gold (Ag-Pd-Cu-Au) alloys  and titanium-aluminum-niobium (Ti-6A1-7Nb) alloys [5, 6]. Many techniques and materials have been used to enhance chemical bonding between metal and acrylic resin, such as metal primers and the tribochemical bonding systems. Metal Primer II (GC America Inc., Chicago, IL, USA) represents one type of chemical retention system and contains a special functional monomer, methacryloyloxyalkyl thiophosphoric methacrylate, which promotes bonding by adhering on the metallic surface due to the presence of a phosphate group, and also produces co-polymerization with the resin to produce both a mechanical and a chemical bond to the metal surface [7-9]. In the Rocatec system (Rocatec system, 3M-ESPE, Seefeld, Germany), metal substrates are pretreated by alumina oxide (Rocatec Pre; 3M-ESPE) particles to clean and rough the surface, leading to surface activation. The surface is then coated by a silicate layer utilizing certain abrasive equipment (Rocatec Plus; 3M-ESPE) which allows airborne silicate particles to be retained on the surface of the metal substrate. After that, the retained silicate particles (silicate layer) are covered with silane (ESPE Sil; 3M-ESPE) . Several studies have shown the positive effects of the Rocatec system on the bonding between different types of metals and veneering materials [11-14]. Treatment with Metal Primer II has also been reported to be effective in improving the bond strength between the Co-Cr alloy and acrylic resin [5, 15], Ni-Cr alloy and composite resin material , and metallic posts to resin cements [16, 17]. However, the effect of Metal Primer II on the bond strength between the Ni-Cr-Be alloy and heat-activated acrylic resin has not been evaluated. The aim of this study was to determine the effects of three surface treatments utilizing two different commercial systems on the bond strength between the Ni-Cr-Be alloy and heat-cured PMMA resin before and after thermocycling. The materials used in this study are presented in Table 1. Eighty rectangular specimens (24 mm in length x 5 mm in width x 0.5 mm thickness) of hard plastic (Great Lakes Orthodontic Products, Inc., Buffalo, NY, USA) were prepared, invested and cast with a Ni-Cr-Be alloy (Ticonium Premium, Inc., Ticonium Co., CMP Industries, Inc., Albany, NY, USA) according to the manufacturer´s instructions. The alloy specimens were divested, electropolished for 5 minutes at a 6 Amp setting (Ti-electro polisher, Ticonium Co.) and cleaned in a general purpose ultrasonic solution (General Purpose Cleaner Concentration, L &amp; R Manufacturing Co., Kearny, NJ, USA) for 10 minutes, then rinsed and dried. For standardization of the bonded acrylic resin material, a wax pattern, 8 mm x 5 mm x 1.5 mm, was attached in the center of the metal strip. Polyvinyl silicone (Aquasil, Dentsply International Inc., York, PA, USA) was used to make a mold for the wax pattern, baseplate wax (Ticonium Co.) was melted and a glass dropper was used to apply the liquid wax to the mold. Materials used in this study for specimen preparation and surface treatments. 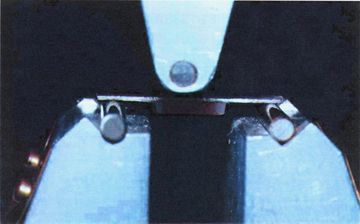 The 80 metal strips with the wax pattern attached were divided into two categories, thermocycled and non-thermocycled, containing four groups (10 specimens per group). The same acrylic resin (Lucitone 199) was used for all specimens. The specimens were invested in dental stone (Microstone, Whip Mix, Louisville, KY, USA), 10 specimens at a time, within a traditional denture flask (Hanau Engineering Co., Inc., Buffalo, NY, USA) . After stone setting, the wax was eliminated by the boil-out technique. The metal strips were removed from the lower half of the flask and prepared for surface treatment. As shown in Table 2, in the control (SA) group, the bonding sites of the metal strips were sandblasted with non-recycled 50 µm aluminum oxide at 0.6MPa with a sandblasting unit (Miniblast, Comco, Sun Valley, CA, USA) for 30 seconds. In the SAMP group, the bonding sites of the metal strips were sandblasted as in the SA group. The bonding sites were then primed with an adhesive primer, Metal Primer II (GC America Inc.) . In the RSOP group, the bonding sites of the metal strips were treated with the Rocatec system (3M-ESPE), applied in accordance with the manufacturer-recommended protocol. Initially, the metal was sandblasted for 15 seconds at 2.5 bar (Rocatec-Pre) with 110 µm alumina particles. Silica coating (Rocatec-Post) was then applied by targeting of the bonding sites with airborne silica particles at a pressure of 2.5 bar for 15 seconds. Silanization was immediately begun by the application of a silanizing agent (ESPE-Sil, 3M-ESPE) to the created silica coating layer, and a thin coat of opaque veneer (Sinfony, 3M-ESPE) was applied and polymerized. In the RS group, the bonding sites were treated with the Rocatec system as in the RSOP group, except that the opaquer veneer (Sinfony, 3M-ESPE) was not applied. After surface treatment of each specimen in the RSOP and RS groups, the mold was packed with denture base resin (Lucitone 199), cured and heat-processed for 9 hours following the manufacturer's recommendations. 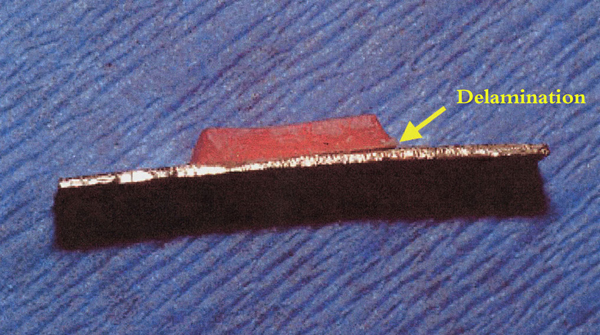 Bonded specimens were recovered after polymerization, and excess resin flashes were removed with a flat-ended diamond bur. Group coding system and the three surface treatments used in the study. The analysis of debonding load was done by non parametric test Kruskal-Wallis One Way Analysis of Variance on Ranks at a=0.05. Statistically significant differences among groups were allocated by Dunn’s post hoc test at the α=0.05 level of significance. Orientation of a specimen on the three-point loading fixture. The median and 25th and 75th percentiles of debonding loads along with SNK grouping are presented in Table 3. Specimens of the SA-TH, RSOP and RSOP-TH groups displayed cracking and signs of detachment or delamination (Fig. 2) before being tested and thus were considered as not having a measurable debonding load; meaningful data could not be obtained. The SAMP group showed the highest value, followed by the RS and SA groups, while the RSOP group showed no measurable debonding load, with statistically significant differences among the aforementioned groups. The same classification among groups remained after thermocycling, except that the debonding load of SA-TH was eliminated. The debonding load was significantly decreased for all groups after thermocycling, with the SA group showing the highest relative reduction 100% followed by the RS (62%) and SAMP(23%) groups. Specimen from the RS group showing delamination (arrow) immediately after removal from the flask. Median and 25th and 75th percentiles of debonding loads of groups tested along with snk grouping.in descednding order. The same letter in SNK grouping column denote no statistically significant differences among groups (P>0.05). Considering differences in experimental conditions utilized in other studies (such as alloy and resin types, surface treatments and numbers of thermal cycles), the results obtained in this study are comparable with those found in literature. The SA and RSOP groups failed to provide an adequate bond between heat-activated acrylic resin and the Ni-Cr-Be alloy, a finding which was expected since it has been shown that sandblasting alone is inadequate for providing mechanical retention between acrylic resin and metal [3-13-18]. However, this study’s results is not in agreement with previous findings proving the positive effect of air abrasion with alumina on the bond strength between resin material and Ag-Pd-Cu-Au and Ti-Al-Nb dental alloys . implying that the chemical state of the surface rather than its roughness is more critical for achieving adequate bond strength of acrylic resin to different dental alloy surfaces. Several studies have evaluated the effect of the Rocatec bonding system with opaquer on self- and/or light-cure resinous materials and have shown that it provides adequate bond strength to metal, but it has not been evaluated with heat-activated acrylic resin [19-21]. In this study, the Rocatec bonding system with opaquer failed to provide a bond between Lucitone 199 and the Ticonium Premium 100 alloy. A possible explanation is that the opaquer is also a resin material, and the temperature and time of curing may cause the bond to deteriorate. Conversely, the use of Rocatec without opaquer enhances the bond strength, a finding which is in agreement with the results found by NaBadalung et al . Although the the effect of Metal Primer II on the Ni-Cr alloy with heat-activated acrylic resin have been tested , this has not been tested yet for Ni-Cr-Be alloys with completely different alloy microstructure.. Metal Primer II provides a significantly higher resin-to-metal bond strength than either the Rocatec system (with or without primer) or sandblasting. This finding differs from that observed by Sarafianou et al , who found no differences between metal treated by Metal Primer II and that treated by Rocatec. This could be attributed to differences in the veneering material, since those investigators used a composite resin, and/or alloy microstructure and different mechanical testing. However the current results agrees with the general trend that has been found by previous studies where the bond strength of resin cements to Ni-Cr alloy increased from 18.4 to 45.1MPa  after the application of Metal Primer II. After thermocycling, the bond strengths of the SAMP and RS groups were significantly decreased (P<0.05), while that of the SA group was eliminated. These results are comparable with those from previous studies [5-11-13, 15-23], and the mechanism of deterioration may be attributed to water softening of the joint during artificial aging  and/or to the development of stresses as a result of heat (thermal stress) during thermal cycling due to differences in the coefficients of thermal expansion between PMMA (70x10-6 /oC at 0~60 oC)  and Ni-Cr-Be alloy (13.9x10-6/°C at 25-500°C) . However, the SAMP group showed a lower relative decrease compared with the RS group, indicating that it is not only higher but also has a lower degradation rate compared with the Rocatec system. This reflects only two specific points, however, and thus a more detailed study combining additional thermocycling groups will provide further insight into the degradation rate of bond strength. Although there are many surface preparation methods for the bonding of base metal framework to PMMA, the surface treatment with Metal Primer II is easy and effective and would aid in the fabrication of a durable and comfortable removable dental prosthesis with a metal base. Additionally, it may allow for successful relining of a metal-base complete denture. Metal Primer II provided metal-resin bond strength significantly higher than that provided by either the Rocatec system or micromechanical (sandblasting) retention. The Rocatec system without opaquer showed satisfactory resin-to-metal bond strength. Both micromechanical retention (sandblasting) and the Rocatec system with opaquer failed to provide a measurable metal-resin bond. Artificial aging has a detrimental effect on bond strength in all bonding systems tested. This research project was financially supported by King Saud University, Vice Deanship of Research Chairs. Darbar UR, Huggett R, Harrison A. Denture fracture--a survey. Br Dent J 1994; 176(9): 342-5. Morris HF, Manz M, Stoffer W, Weir D. Casting alloys: the materials and “The Clinical Effects”. Adv Dent Res 1992; 6: 28-31. NaBadalung DP, Powers JM, Connelly ME. Comparison of bond strengths of three denture base resins to treated nickel-chromium-beryllium alloy. J Prosthet Dent 1998; 80(3): 354-61. Sharp B, Morton D, Clark AE. Effectiveness of metal surface treatments in controlling microleakage of the acrylic resin-metal framework interface. J Prosthet Dent 2000; 84(6): 617-22. Suzuki T, Takahashi H, Arksornnukit M, Oda N, Hirano S. Bonding properties of heat-polymerized denture base resin to Ti-6Al-7Nb alloy. Dent Mater J 2005; 24(4): 530-5. Ishii T, Koizumi H, Tanoue N, Naito K, Yamashita M, Matsumura H. Effect of alumina air-abrasion on mechanical bonding between an acrylic resin and casting alloys. J Oral Sci 2009; 51(2): 161-6. Freitas AP, Francisconi PA. Effect of a metal primer on the bond strength of the resin-metal interface. J Appl Oral Sci 2004; 12(2): 113-6. Silveira de Araújo C, Incerti da Silva T, Ogliari FA, Meireles SS, Piva E, Demarco FF. Microleakage of seven adhesive systems in enamel and dentin. J Contemp Dent Pract 2006; 7(5): 26-33. Silikas N, Wincott PL, Vaughan D, Watts DC, Eliades G. Surface characterization of precious alloys treated with thione metal primers. Dent Mater 2007; 23(6): 665-73. Kourtis SG. Bond strengths of resin-to-metal bonding systems. J Prosthet Dent 1997; 78(2): 136-45. Sarafianou A, Seimenis I, Papadopoulos T. Effectiveness of different adhesive primers on the bond strength between an indirect composite resin and a base metal alloy. J Prosthet Dent 2008; 99(5): 377-87. Yanagida H, Tanoue N, Ide T, Matsumura H. Evaluation of two dual-functional primers and a tribochemical surface modification system applied to the bonding of an indirect composite resin to metals. Odontology 2009; 97(2): 103-8. Matsuda Y, Yanagida H, Ide T, Matsumura H, Tanoue N. Bond strength of poly(methyl methacrylate) denture base material to cast titanium and cobalt-chromium alloy. J Adhes Dent 2010; 12(3): 223-9. Mazurat RD, Pesun S. Resin-metal bonding systems: a review of the Silicoating and Kevloc systems. J Can Dent Assoc 1998; 64(7): 503-7. Shimizu H, Kurtz KS, Tachii Y, Takahashi Y. Use of metal conditioners to improve bond strengths of autopolymerizing denture base resin to cast Ti-6Al-7Nb and Co-Cr. J Dent 2006; 34(2): 117-22. Sahafi A, Peutzfeld A, Asmussen E, Gotfredsen K. Effect of surface treatment of prefabricated posts on bonding of resin cement. Oper Dent 2004; 29(1): 60-8. Sahafi A, Peutzfeldt A, Asmussen E, Gotfredsen K. Retention and failure morphology of prefabricated posts. Int J Prosthodont 2004; 17(3): 307-12. Matsumura H, Tanaka T, Atsuta M. Effect of acidic primers on bonding between stainless steel and auto-polymerizing methacrylic resins. J Dent 1997; 25(3-4): 285-90. Vojvodic D, Jerolimov V, Celebic A, Catovic A. Bond strengths of silicoated and acrylic resin bonding systems to metal. J Prosthet Dent 1999; 81(1): 1-6. Clelland NL, van Putten MC, Brantley WA, Knobloch LA. Adhesion testing of a denture base resin with 5 casting alloys. J Prosthodont 2000; 9(1): 30-6. Kim JY, Pfeiffer P, Niedermeier W. Effect of laboratory procedures and thermocycling on the shear bond strength of resin-metal bonding systems. J Prosthet Dent 2003; 90(2): 184-9. Di Francescantonio M, de Oliveira MT, Garcia RN, Romanini JC, da Silva NR, Giannini M. Bond strength of resin cements to Co-Cr and Ni-Cr metal alloys using adhesive primers. J Prosthodont 2010; 19(2): 125-9. Radhi A, Juszczyk AS, Curtis RV, Sherriff M, Radford DR, Clark RK. Effect of GC METALPRIMER II on bond strength of heat-cured acrylic resin to titanium alloy (Ti-6Al-4V) with two different surface treatments. Eur J Prosthodont Restor Dent 2008; 16(3): 132-7. Fox NA, McCabe JF, Buckley JG. A critique of bond strength testing in orthodontics. Br J Orthod 1994; 21(1): 33-43. Kuntman A, Baysal B. Estimation of thermodynamic parameters for poly(ethyl methacrylate)/isopropyl alcohol system from intrinsic viscosity measurements. Polymer (Guildf) 1993; 34: 3723-6. Zinelis S, Tsetsekou A, Papadopoulos T. Thermal expansion and microstructural analysis of experimental metal-ceramic titanium alloys. J Prosthet Dent 2003; 90(4): 332-8.